The only thing really wrong with it is the diameter. But its mass is normal for a white dwarf, and its temperature is plausible too, just not at that age. So if it had an age of 13 billion years or something, then it would make perfect sense. I'll go put it on the bug report thread to make a record of it over there, since it's a bug/glitch. Anybody know whether a planet this warm would have icecaps at the poles? 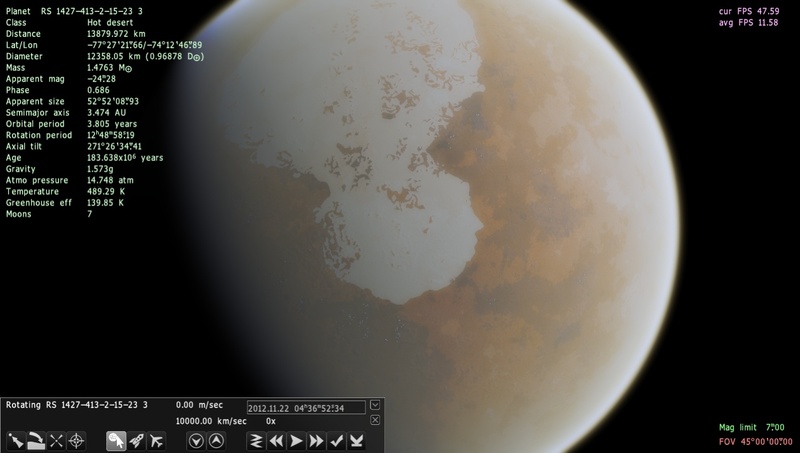 Actually, I'm not sure if those are just sand filled craters which just happen to be near the poles. 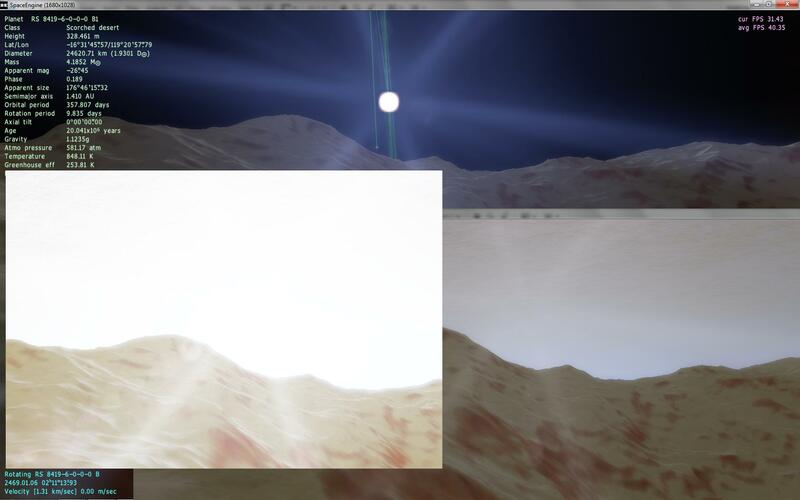 This planet is also around an A type star, so the tinting could just be making it unclear. This is the first time I have EVER seen this. It's a Gas Giant orbiting around another Gas Giant. 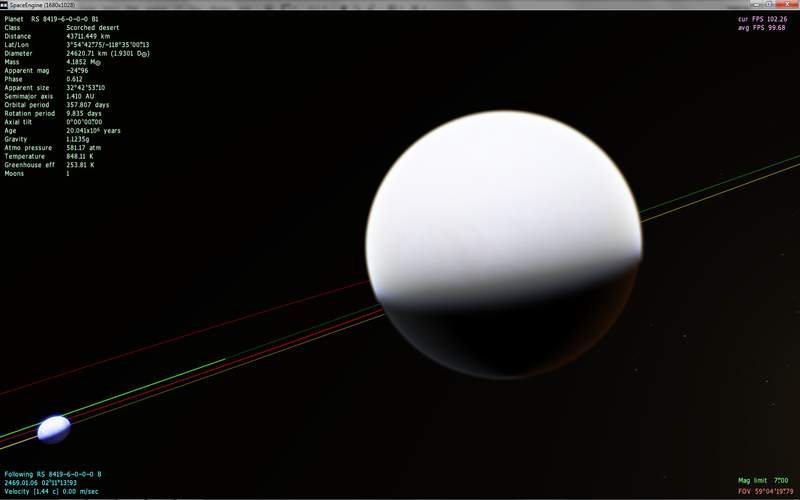 Normally, I've seen Ice Giant moons around Gas Giants, but NEVER 2 Gas Giants orbiting each other. I posted an even more remarkable binary gas giant earlier, check page 2 of this thread. I think this could be considered as a rare thing, even an anomaly. Selena with Desert moon ! This is a tidally-locked Terra with Life in a nebula. 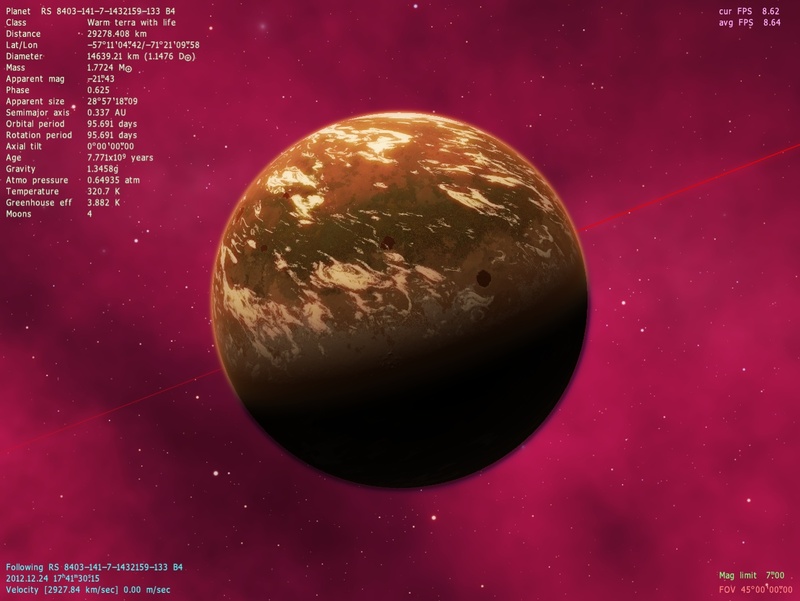 Its binary star system have another planet with life, with other tidally locked planets. 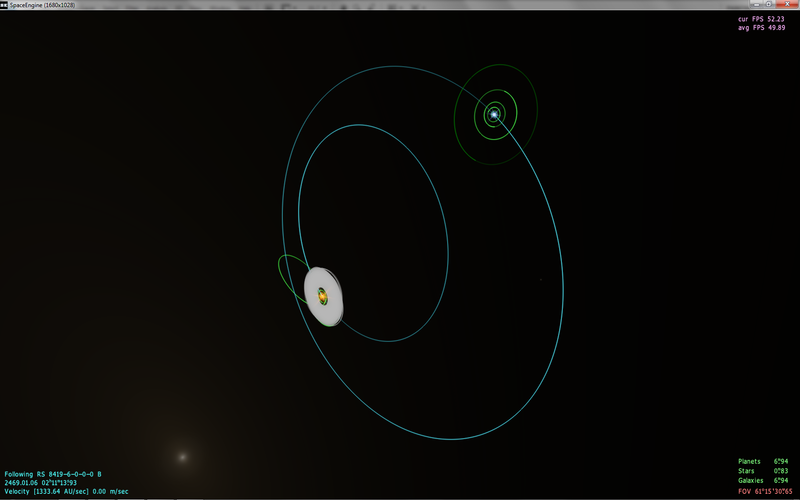 I think I win the award for the strangest star system. Here we have a double planet system. Both are scorched deserts. The first has a mass of 1.8 earth, the second 1.1. The primary has a surface temperature of about 2000 K, while the secondary has a surface temperature of about 2400 K due to its Inexplicable atmosphere of 1.27 atm. Considering the two orbit at a distance of about 0.897 AU from their star (star A in the system, a red giant), and the star has a radius of 0.715 AU (for a total planet-photosphere distance of 0.182 AU or roughly 40% the sun-mercury distance), this atmosphere is clearly impossible, even if we make the necessary primary assumption that the atmosphere is composed of a heavy element such as gaseous iron). At such a distance the parent star takes up a good 107 degrees of the sky to the point where only about 20% the surface of the planet experiences night at any given time. There are several asteroids around A with their orbits offset such that some of them travel THROUGH the star on their orbits, and spend the rest of their time at roughly the same distant from the star as the binary planets. A4 has, oddly, an axial tilt of 0.00.00.00., is also part of a double planet system, and has an atmospheric pressure of 89 atm such that a third of its surface temperature is due to the greenhouse effect. A9 is also a double planet system (surprise, surprise), and is perhaps the most interesting The two orbit eachother with a tilt of roughly 70 degrees away from their orbital plane, in the direction of A. Because both have a little axial tilt with respect to their orbital paths around eachother, this forces them both into a near lock with A -about 30% the surface of each body receives neverending daylight indefinitely, though the planets are not tidally locked to A. That is to say: we have here a case of daylight locking due to axial tilt, but it is seen in two planets orbiting eachother and a star. ), but at its closest it is slightly closer than A6. This makes its surface temperature range from around 121 K to 409 K. It, like A1, A4, and A9 is also composed of a binary planet system. But I'm just getting started. that's just the A system. There's an entire other star- B, a white main sequence star. B1 is a binary planet system (these aren't even interesting anymore T.T) with a primary that has an atmosphere of 581 atm. (It's 600 km thick!) The atmosphere is so thick that it reflects a large portion of the oncoming light, making the planet appear white and featureless. The remaining light that does penetrate scatters to light a nearly featureless landscape; there are no craters on the planet. The majority of the small amount of texture the planet does have is focused into small patches of swirling land with orange veins running through it which I have no explanation for. A view of the planet and its companion, showing its nearly featureless appearance due to a thick atmosphere. At first I thought that there was a texture loading error due to the lack of features. B6 is a binary planet system (surely all these binaries can't be coincidences...) with axial tilt 309 degrees. The primary has decent ice caps (above and below around 70 degrees from the equator) and due to the heavy blue light from the white parent star, the secondary which would appear a brownish red in the sol system appears a sickly green color. Oddly, while the red giant (A) has nearly 1000 asteroids orbiting it, the white main sequence (B) has zero. this atmosphere is clearly impossible, even if we make the necessary primary assumption that the atmosphere is composed of a heavy element such as gaseous iron). 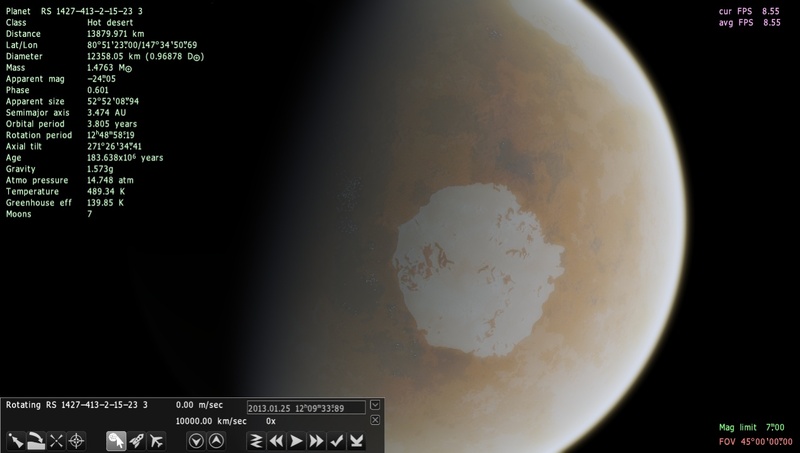 Well, my best guess is this planet originally had a very thick, Venus-like atmosphere, and the red giant has only grown very recently so it hasn't lost all of its atmosphere yet. 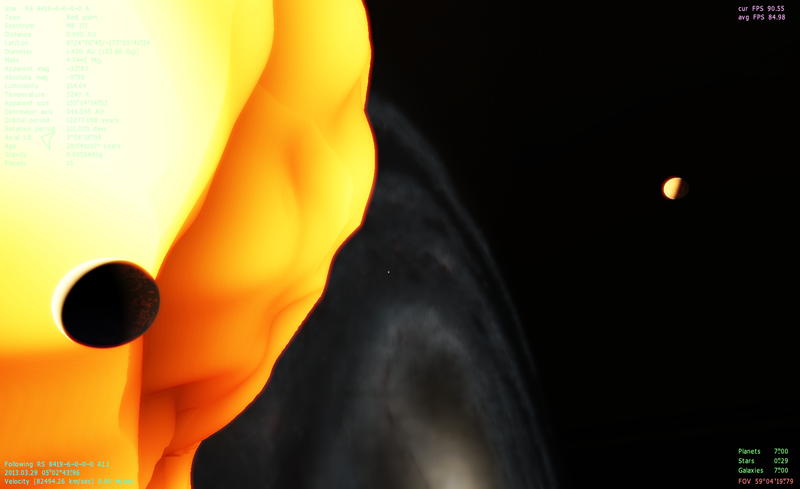 In the next version of SE, we will actually get to see the planet have a huge comet tail. Oh wow, that is really weird. Gas giants could pass through a red giant's outer layers mostly unscathed, but little asteroids? That's a wonderfully crazy system. Yea, binary planets (as opposed to a planet and a large moon) are overly common in my opinion. In our solar system, among the 'standard' planets, the Earth-Moon system comes closest to a binary planet system. Up next would probably be the Pluti-Charon pair. The same can be said about high axial tilt planets. 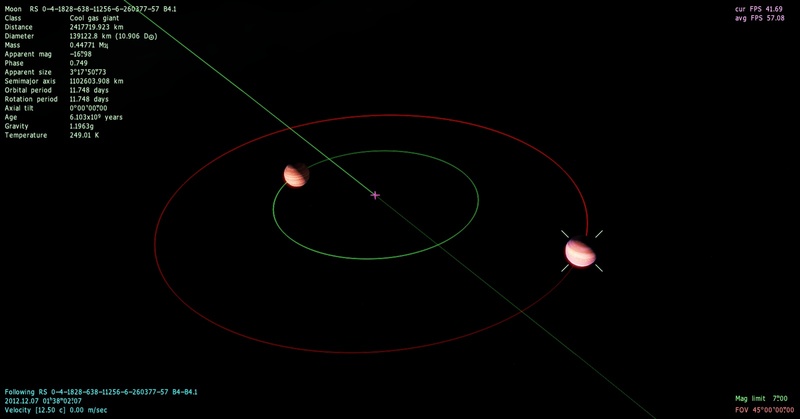 Just about every other planet I've encountered has had a high tilt or retrograde rotation, as opposed to just two or three planets in our solar system (Venus, Uranus, and Pluto-Charon). the Earth-Moon system comes closest to a binary planet system. Up next would probably be the Pluto-Charon pair. I would think the Pluto-Charon system would be first. Pluto-Charon is definitely first, and is definitely a binary in my book. The Earth-Moon system is in no way more binary than Pluto-Charon, and Earth-Moon really should not ever be considered binary. I like to pretend that the cutoff point is whether or not the barycentre lies within or outside of the parent. Since the Earth-moon barycentre is located in the earth's mantle, while the pluto'charon barycentre lies in the space between the two, I like to say the former is not a binary system while the latter is. Also, due to the current definition of "planet" we'd have to exclude Pluto-Charon anyway as Pluto isn't a planet at all. 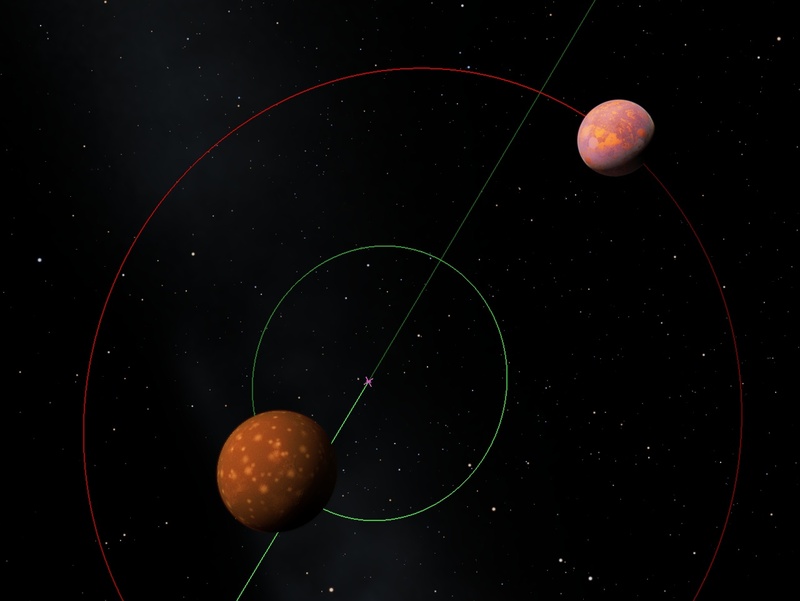 Instead they are something along the lines of "binary planetary mass objects"
I'd like to propose three classes for binaries: Non-binary, sub-binary, and full binary. I like to pretend that the cutoff point is whether or not the barycentre lies within or outside of the parent. This is not a very useful way of characterizing a binary system. 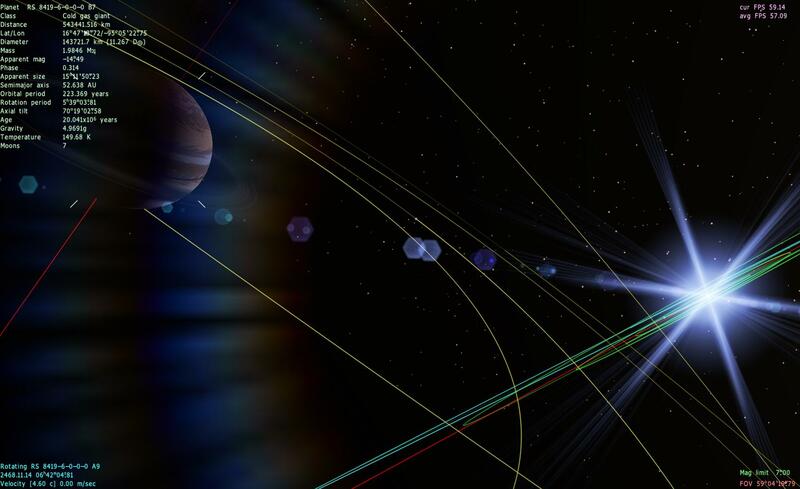 The Sol-Jupiter barycenter lies far outside Sol, yet no one would say that Sol-Jupiter constitutes a binary. Earth-Moon barycenter is currently inside Earth, but in a few billion years the barycenter will move outside of Earth due to the Moon's steadily increasing distance. Would you say that Earth-Moon would form a binary then, even though they don't now and nothing will have changed about them? That would make no sense. The only useful way to determine a binary is to set a mass ratio. Something like 1:20 for example. 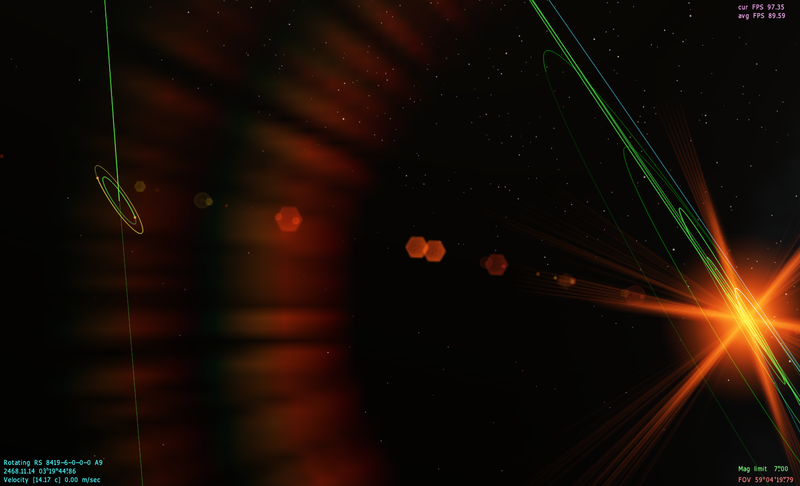 Whether a barycenter is inside the primary or not is useless since that depends mostly on orbit. Also, due to the current definition of "planet" we'd have to exclude Pluto-Charon anyway as Pluto isn't a planet at all. I think it's not important to distinguish categories here, only to define binary objects. What population those objects are in is irrelevant to the question. I did say of the standard (as in not dwarf) planets, the Earth-Moon system is the closest it gets to a binary system, and yes I know it's nowhere near being a binary system.